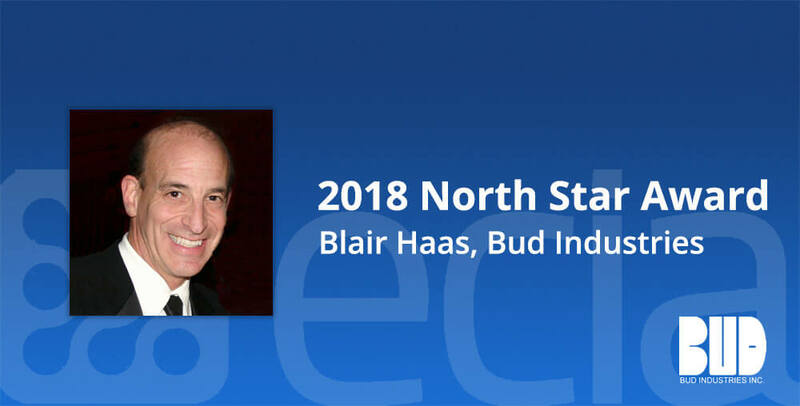 ECIA Presents 2018 North Star Award to Blair Haas of Bud Industries » HHP Associates, Inc. The ECIA North Star Award, the association’s highest leadership honor, was awarded to Blair Haas of Bud Industries. For millennia, the North Star provided the navigational basis to those who sought to explore our world and to make it better. The North Star Award is so named to reflect extraordinary leadership, guidance, and perseverance within our industry. ECIA recognizes individuals who made significant contributions to the industry over the course of their careers and who set the standard for those who follow. The Electronic Components Industry Association (ECIA) is made up of the leading electronic component manufacturers, their manufacturer representatives and authorized distributors. ECIA members share a common goal of promoting and improving the business environment for the authorized sale of electronic components. Comprised of a broad array of leaders and professionals representing all phases of the electronics components supply chain, ECIA is where business optimization, product authentication and industry advocacy come together. ECIA members develop industry guidelines and technical standards, as well as generate critical business intelligence. For more information, visit www.ecianow.org or call 678-393-9990.